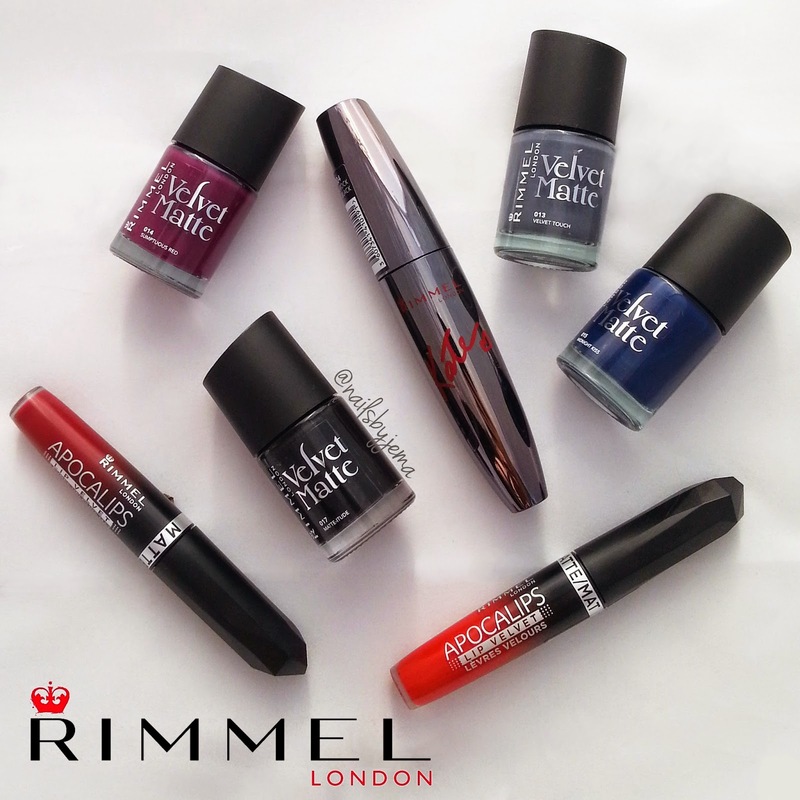 N A I L S B Y J E M A: Rimmel London Velvet Matte Collection Swatches & Review! 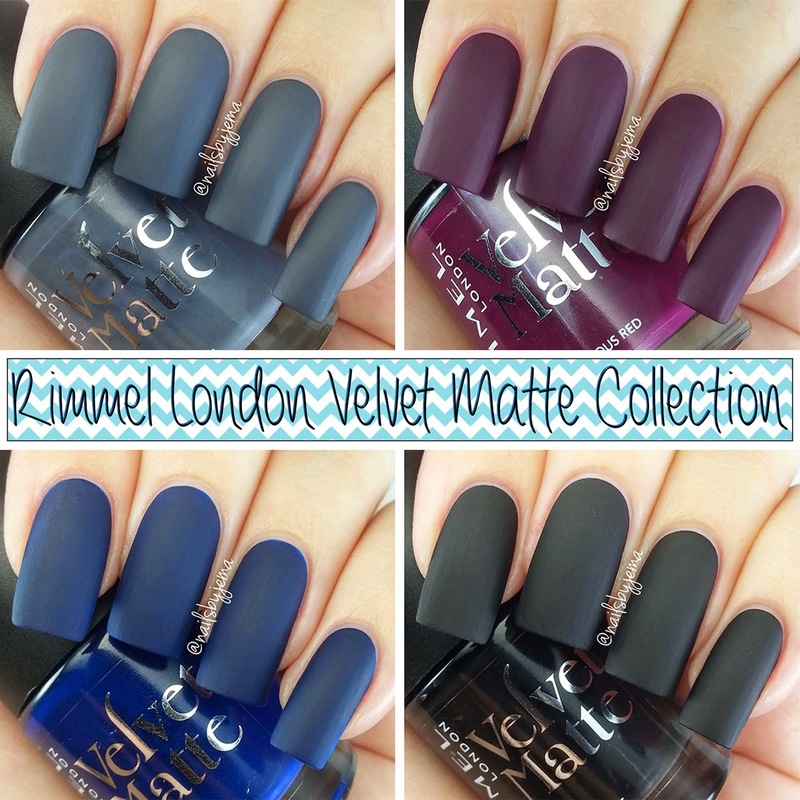 Rimmel London Velvet Matte Collection Swatches & Review! In today's blog post I have swatches and reviews of Rimmel London's newly released Velvet Matte polishes. A quick Google search tells me these came out last year on the other side of the globe, but they have JUST been released in Australia. Let me start by saying I have found my new favorite Matte polishes. Ever. I am in love, you guys. Not only are these the perfect Autumn/Fall colours but they are so damn pretty. Even my boyfriend, who usually looks at my nails when I show him with indifference and boredom, actually grabbed my hands and exclaimed they were 'awesome'! If that's not a reason to go buy them then I don't know what is!! The bottle is the same as all of Rimmel's Salon Pro nail polishes and has the awesome feature of the wide and flat brush. This makes these polishes so easy to apply and in only ONE stroke!! All four I could get ALMOST opaque on the first coat, and I'm really picky with what I call opaque. For most people these are one coat to opaque, but I like them to be solid colour when I hold them up to light, so for my preference they needed two coats for that. For most people though, one coat and one stroke application means you can get all nails painted and done in one minute or less. Great for last minute polish application before dashing out the door. It's really that easy. I found it easiest to apply the polish a little thicker than I would most polishes, but matte polish tends to dry a lot faster, and with it being only one coat, drying time is less than 2 minutes to 100% dry. Applying the coats a little thicker than normal reduces any bumps and brush lines that matte polishes tend to get because you can't top coat it to smooth it out. Sumptuous Red seemed more a dark warm or raspberry shade purple to me. To me this is the most unique colour in the collection. It's so pretty and Autumn/Wintery, so perfect for the cooler months heading our way in Australia. The brush made a perfect cuticle line and I didn't need to do any clean up on this one! The photo below is two coats. 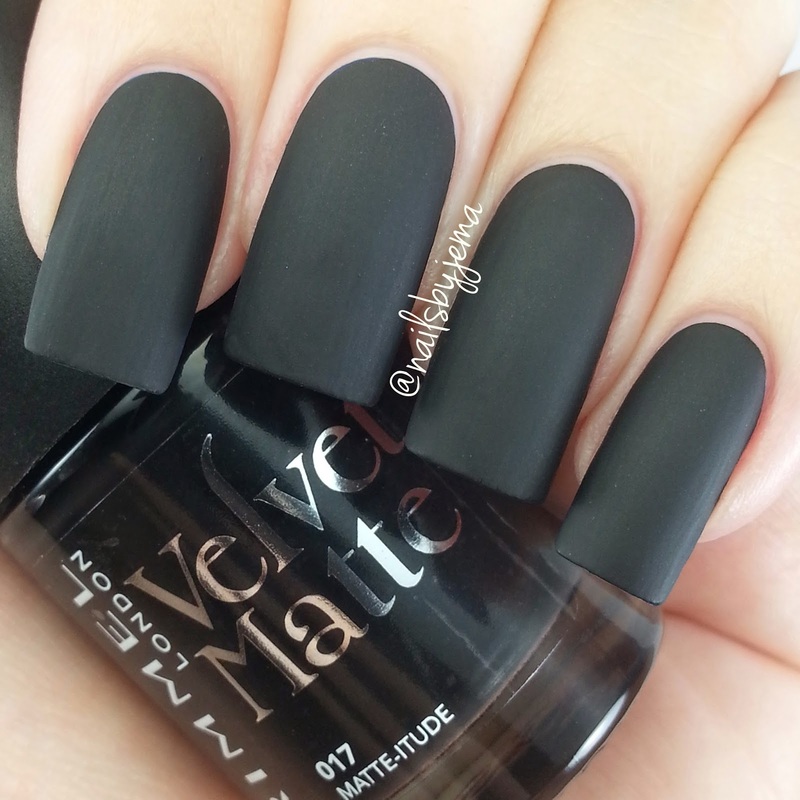 Matte-itude is the perfect matte black. I know a lot of people aren't huge fans of black polish, but I think the matte aspect takes it from high school goth to rock chic. And trust me, I was a high school goth. The matte finish is really beautiful on this polish, and if it's still too harsh, it can be an awesome base colour for some metallic stamping or nail art! I used two coats for the photo below. Midnight Kiss is a dark royal blue. So pretty. This polish is so lovely on it's own, but the matte effect really kicks it up a level. The photo below is two coats. 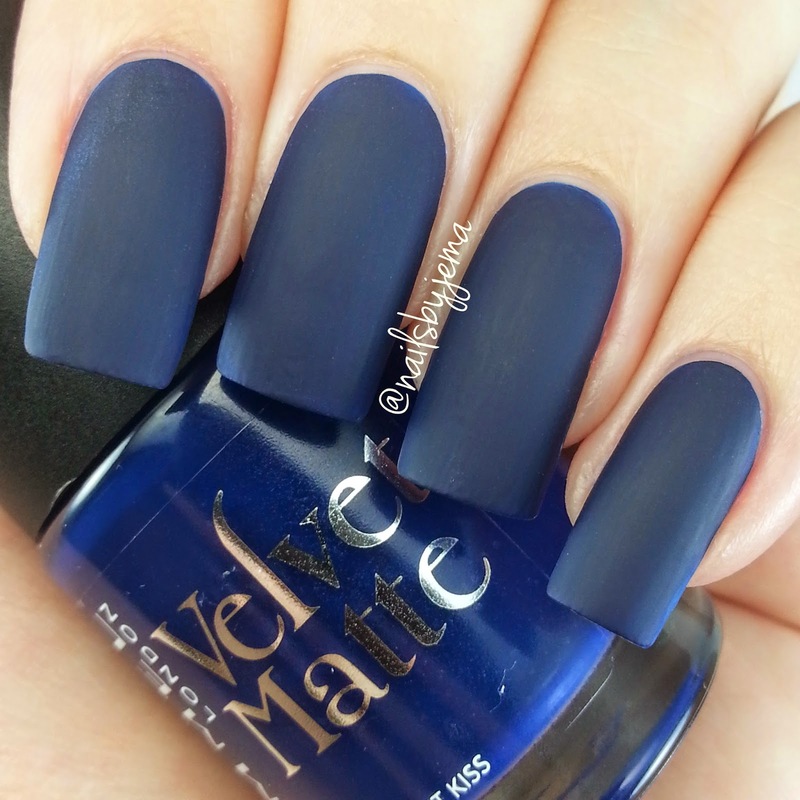 And finally, Velvet Touch is a dark blue based grey. 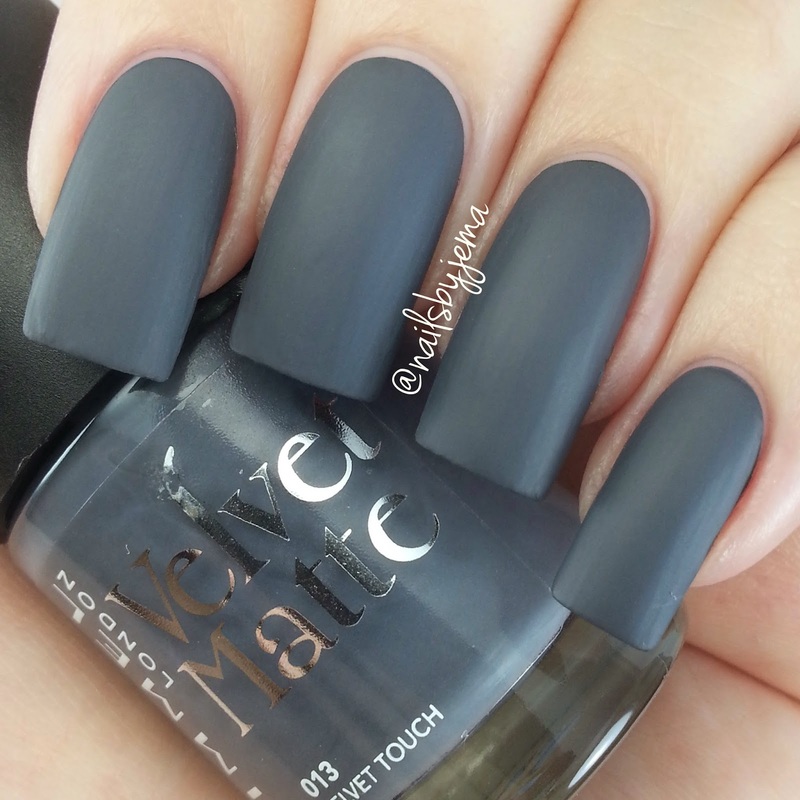 I am obsessed with grey polishes at the moment so will be reaching for this a LOT I think. The photo below is two coats. I had an itch to do a grey mani so I added some gold studs from eBay over Velvet Touch and look how classy it looks. 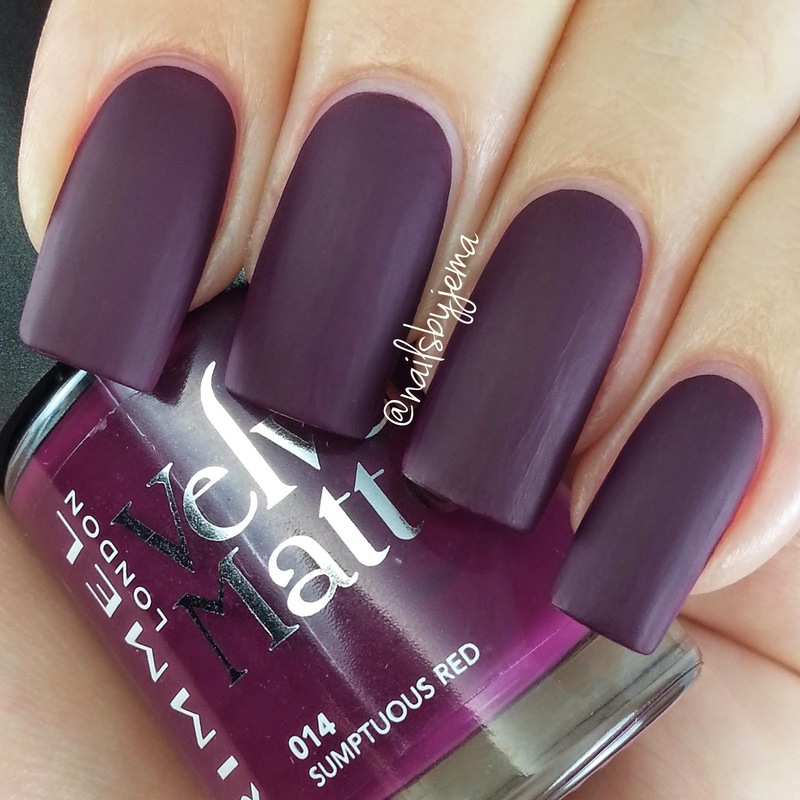 The matte effect really makes polish look incredible and classy. With most matte polishes you need to apply a base coat to get it to last better as the matte polish tends to have less lasting power than normal polish, but any base coat sticks it down perfectly. I was sent these polishes by COTY PR and it included the new Idol Eyes mascara and two of the Apocolips Matte lipsticks to try too. I WILL be posting a separate review of these later on once I am going out and can do a face of makeup. One word though from my home trial.. FANTASTIC! Rimmel have really started excelling in the polish and makeup game which is great because they're so affordable and great quality. 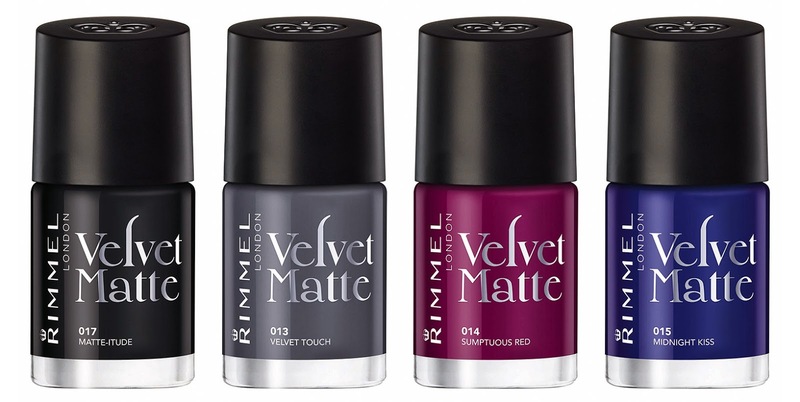 The Rimmel London Velvet Matte Nail Collection are $8.95 each and are available now from Priceline, Priceline Pharmacy, Chemist Warehouse, Target, Kmart, BIG W, selected pharmacies and selected Coles and Woolworths. Trust me, do your nails a favour and pick them all up. Blank Templates For Your Nail Art! Obsessed with Houndstooth and Essie Polish!